The angiosperms (also called flowering plants) are a major group of land plants, with 250,000 species having been described. Angiosperms comprise one of the two groups in the seed plants, the other group being gymnosperms. The flowering plants cover their seeds by including them in a true fruit. They bear the reproductive organs in a structure called a flower; the ovule is enclosed within a carpel (female reproductive organ of a flower), which will lead to a fruit. In gymnosperms, the ovule is not enclosed at pollination and the seeds are not in a true fruit, although occasionally fleshy structures may cover the seed. The dominant vegetation on the surface of the earth, with representation in aquatic environments as well, angiosperms provide great benefit to humans. On the one hand, such plants as the grasses (rice, corn, wheat, oats, sugar cane, etc. ), the rose family (apples, pears, cherries, etc. ), potatoes, tomatoes, peppers, coconuts, and olives are a central component of human nutrition and the human economy. Angiosperms also are a source of wood for shelter, paper for writing, fiber for clothes, and a variety of medicines. On the other hand, angiosperms also provide internal benefit to people, such as the joy they provide through the tastes and textures of fruits and the sights and smells of flowers. They are used for landscaping and for decorating homes, as the subject matter of works of art. Angiosperms are integral to the environment and biogeochemical cycles of the planet, provide food and a living place for countless species, and help to convert radiant energy to a form that other organisms can use. The division Magnoliophyta is also used taxonomically to designate angiosperms. The botanical term "angiosperm," from the ancient Greek αγγειον (receptacle) and σπερμα (seed), was coined in the form Angiospermae by Paul Hermann in 1690, as the name of one of his primary divisions of the plant kingdom. This division included flowering plants possessing seeds enclosed in capsules, in contradistinction to his Gymnospermae, or flowering plants with achenial or schizo-carpic fruits—the whole fruit or each of its pieces being here regarded as a seed and naked. The term and its antonym were maintained by Carolus Linnaeus with the same sense, but with restricted application, in the names of the orders of his class Didynamia. Its use with any approach to its modern scope only became possible after Robert Brown had established in 1827 the existence of truly naked ovules in the Cycadeae (cycads) and Coniferae (conifers), entitling them to be correctly called gymnosperms. From that time onwards, so long as these Gymnosperms were reckoned as dicotyledonous flowering plants (seeds with two embryonic leaves), the term angiosperm was used antithetically by botanical writers, but with varying limitation, as a group-name for other dicotyledonous plants. The advent in 1851 of Wilhelm Friedrich Benedikt Hofmeister's discovery of the changes proceeding in the embryo-sac of flowering plants, and his determination of the correct relationships of these with the Cryptogamia, fixed the position of gymnosperms as a class distinct from Dicotyledons. The term angiosperm then gradually came to be accepted as the suitable designation for the whole of the flowering plants other than gymnosperms, and as including therefore the classes of Dicotyledons and Monocotyledons. Dicotyledons or "dicots" is a name for a group of flowering plants whose seed typically contains two embryonic leaves or cotyledons, and Monocotyledons or "monocots" are flowering plants with one cotyldeon. This is the sense in which the term angiosperm is used today. Angiosperms constitute the dominant vegetation of the earth's surface at the present epoch. There is no land-area from the poles to the equator, where plant-life is possible, upon which angiosperms are not found. They also occur abundantly in the shallows of rivers and fresh-water lakes, and, to a lesser extent, in salt lakes and in the sea. Such aquatic angiosperms are not, however, considered primitive forms, but rather derived from immediate land-ancestors. Associated with this diversity of habitat is great variety in general form and manner of growth. The familiar duckweed, which covers the surface of a pond, consists of a tiny green "thalloid" shoot, one which shows no distinction of parts: stem and leaf, and a simple root growing vertically downwards into the water. The great forest tree has a shoot, which in the course perhaps of hundreds of years, has developed a wide-spreading system of trunk and branches, bearing on the ultimate twigs or branchlets innumerable leaves, while beneath the soil a widely-branching root-system covers an area of corresponding extent. Between these two extremes is every conceivable gradation, embracing aquatic and terrestrial herbs, creeping, erect or climbing in habit, shrubs and trees, and representing a much greater variety than is to be found in the other subdivision of seed-plants, the gymnosperms. The flowering plants are usually treated as a division in biology. As this is a group above the rank of family, there is a free choice of name: Art 16 of the International Code of Botanical Nomenclature (ICBN) allows either a descriptive name or a name based on a generic name. 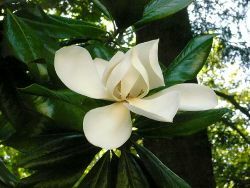 The favorite name in the latter category is Magnoliophyta (at the rank of division, based on the Magnolia). The most popular descriptive name is Angiospermae (Angiosperms), with Anthophyta ("flowering plants") a second choice. The internal classification of this group has undergone considerable revision as ideas about their relationships change. The Cronquist system (Cronquist 1981), which places flowering plants into two broad categories of monocotyledons and dicotyledons, is still widely used but is no longer believed to reflect phylogeny (the study of evolutionary relatedness among various groups of organisms). A general consensus about how the flowering plants should be arranged is beginning to emerge, through the work of the Angiosperm Phylogeny Group (APG 1998), who published an influential reclassification of the angiosperms in 1998. An update incorporating more recent research was published in 2003 (APG 2003). Traditionally, the flowering plants are divided into two groups, which in the Cronquist system are called Magnoliopsida (at the rank of class, based on Magnolia) and Liliopsida (at the rank of class, based on Lilium). Much more popular are their descriptive names (as allowed by Art 16 of the ICBN): Dicotyledones (some prefer Dicotyledoneae) and Monocotyledones (some prefer Monocotyledoneae), which have been in use for very long. In English, a member of either group may be called a "dicotyledon" (plural "dicotyledons") and "monocotyledon" (plural "monocotyledons"), or more popularly "dicot" (plural "dicots") and "monocot" (plural "monocots"). These names derive from the fact that the dicots often (but not always) have two cotyledons (embryonic leaves) within each seed, while the monocots typically will have one only. From a diagnostic point of view, the number of cotyledons is neither a particularly handy nor reliable character. Recent studies show that the monocots are a "good" or "natural" group (a holophyletic or monophyletic group), while the dicots are not (a paraphyletic group). However, within the dicots a "good" group exists, which includes most of the dicots. This new group is semi-informally called the "eudicots" or "tricolpates." The name "tricolpates" derives from the type of pollen found throughout this group. The name eudicots is formed by preceding "dicot" by the prefix "eu-" (greek 'eu'= "true"), as the eudicots share the characters traditionally attributed to the dicots, such a four- or five-merous flowers. The uninitiate may be tempted to jump to the conclusion that "eudicot" is short for "eudicotyledon" but it is not: the name is eudicot. A formal name that is sometimes used for this group is Rosopsida (at the rank of class, based on Rosa). Separating this group of eudicots from the rest of the (former) dicots leaves a remainder, which sometimes are called informally "palaeodicots" (the prefix "palaeo-" means old, and derives from the classic greek). As this remainder group is not a "good" group, this is a term of convenience only. Five features are used to distinguish monocots from dicots: the number of cotyledons (a significant part of the embryo within the seed of a plant, which usually become the embryonic first leaves of a seedling); the arrangement of vascular tissue in roots, in stems, and in leaves; and the number of flowering parts. In monocots, there is one cotyledon in the seed, the root xylem and phloem are in a ring, vascular bundles are scattered in the stem, leaf veins form a parallel pattern, and flower parts are in threes and multiples of three. In dicots, there are two cotyledons in the seed, the root phloem is between the arms of xylem, the vascular bundles are in a distinct ring, leaf veins form a net pattern, and the flower parts are in fours or five and multiples of four and five. Over 250,000 species of flowering plants have been described, within about 460 families. In the list above (showing only the 9 largest families), the Orchidaceae, Poaceae, Cyperaceae, and Araceae are monocot families; the others are dicot families. The first evidence of angiosperms appears in the fossil record approximately 140 million years ago, during the Jurassic period (203-135 million years ago). Based on current evidence, it seems that the ancestors of the angiosperms and the Gnetophytes (three related families of woody plants) diverged from one another during the late Triassic (220-202 million years ago). Fossil plants with some identifiable angiosperm characteristics appear in the Jurassic and early Cretaceous (135-65 million years ago), but in relatively few and primitive forms. The great angiosperm radiation, when a great diversity of angiosperms appear in the fossil record, occurred in the mid-Cretaceous (approximately 100 million years ago). By the late Cretaceous, angiosperms appear to have become the predominant group of land plants, and many fossil plants recognizable as belonging to modern families (including beech (Fagus), oak (Quercus), maple(Acer), and magnolia (Magnoliaceae) appeared. The extinct Mesozoic Cycadeoidea, a group related to the cycads, are thought to be the ancestral angiosperm stock, though the original angiosperm stock has not yet been traced. Agriculture is almost entirely dependent on angiosperms, either directly, or indirectly through livestock feed. Of all the families of flowering plants, the Poaceae, or grass family, is by far the most important, providing the bulk of all products and feedstocks (rice, corn (maize), wheat, barley, rye, oats, millet, sugar cane, sorghum), with the Fabaceae, or legume family, in second place. Also of high importance are the Solanaceae, or nightshade family (potatoes, tomatoes, and peppers, among others), the Cucurbitaceae, or gourd family (also including pumpkins and melons), the Brassicaceae, or mustard plant family (including rapeseed and cabbage), and the Apiaceae, or parsley family. Many of our fruits come from the Rutaceae, or rue family, and the Rosaceae (rose family, including apples, pears, cherries, apricots, plums, etc). In some parts of the world, certain single species assume paramount importance because of their variety of uses. An example is the coconut (Cocos nucifera) on Pacific atolls. Another example is the olive (Olea europaea) in the Mediterranean. Flowering plants also provide economic resources in the form of wood, paper, fiber (cotton, flax, and hemp, among others), medicines (digitalis, camphor), decorative and landscaping plants, and many, many other uses. In internal structure, the variety of tissue-formation in angiosperms far exceeds that found in gymnosperms. The vascular bundles of the stem belong to the collateral type, that is, the elements of the wood or xylem and the bast or phloem stand side by side on the same radius. In the larger of the two great groups into which the angiosperms are divided, the Dicotyledons, the bundles in the very young stem are arranged in an open ring, separating a central pith from an outer cortex. In each bundle, separating the xylem and phloem, is a layer of meristem or active formative tissue, known as cambium; by the formation of a layer of cambium between the bundles (interfascicular cambium) a complete ring is formed, and a regular periodical increase in thickness results from it by the development of xylem on the inside and phloem on the outside. The soft phloem soon becomes crushed, but the hard wood persists, and forms the great bulk of the stem and branches of the woody perennial. Owing to differences in the character of the elements produced at the beginning and end of the season, the wood is marked out in transverse section into concentric rings, one for each season of growth—the so-called annual rings. In the smaller group, the Monocotyledons, the bundles are more numerous in the young stem and scattered through the ground tissue. Moreover, they contain no cambium and the stem once formed increases in diameter only in exceptional cases. As in gymnosperms, branching is monopodial; dichotomy, or the forking of the growing point into two equivalent branches that replace the main stem, is absent both in the case of the stem and the root. The leaves show a remarkable variety in form, but are generally small in comparison with the size of the plant; exceptions occur in some Monocotyledons, e.g. in the Aroid family, where in some genera the plant produces one huge, much-branched leaf each season. In rare cases, the main axis is unbranched and ends in a flower, as, for instance, in the tulip, where scale-leaves, forming the underground bulb, green foliage-leaves, and colored floral leaves are born on one and the same axis. Generally, flowers are formed only on shoots of a higher order, often only on the ultimate branches of a much branched system. A potential branch or bud, either foliage or flower, is formed in the axil of each leaf; sometimes more than one bud arises, as for instance in the walnut (Juglans), where two or three stand in vertical series above each leaf. Many of the buds remain dormant, or are called to development under exceptional circumstances, such as the destruction of existing branches. For instance, the clipping of a hedge or the lopping of a tree will cause to develop numerous buds which may have been dormant for years. Leaf-buds occasionally arise from the roots, when they are called adventitious; this occurs in many fruit trees, poplars (Populus), elms (Ulmus) and others. For instance, the young shoots seen springing from the ground around an elm are not seedlings but root-shoots. Frequently, as in many Dicotyledons, the primary root, the original root of the seedling, persists throughout the life of the plant, forming, as often in biennials, a thickened tap-root, as in carrot (Daucus carota), or in perennials, a much-branched root system. In many Dicotyledons and most Monocotyledons, the primary root soon perishes, and its place is taken by adventitious roots developed from the stem. The characteristic feature of angiosperms is the flower, which shows remarkable variation in form and elaboration, and provides the most trustworthy external characteristics for establishing relationships among angiosperm species. The function of the flower is that of ensuring fertilization of the ovule and development of fruit containing seeds. The floral apparatus may arise terminally on a shoot or from the axil of a leaf. Occasionally, as in violets, a flower arises singly in the axil of an ordinary foliage-leaf. However, more typically, the flower-bearing portion of the plant is sharply distinguished from the foliage-bearing or vegetative portion, and forms a more or less elaborate branch-system called an inflorescence. As in gymnosperms, spores produced by flowers are of two kinds: microspores or pollen-grains, borne in the stamens (or microsporophylls), and megaspores, in which the egg cell is developed, contained in the ovule and enclosed in the carpel (or megasporophyll). The flower may consist only of these spore-bearing parts, as in willow ("Salix"), where each flower comprises only a few stamens or two carpels. Usually, however, other structures are present and serve both to protect the sporophylls and to form an attractive envelope. The individual members of these surrounding structures are called sepals and petals (or tepals in a flower such as Michelia). The outer series (calyx of sepals) is usually green and leaf-like, and functions to protect the rest of the flower, especially in the bud. The inner series (corolla of petals) is generally white or brightly colored, and more delicate in structure, and functions in attracting a particular insect or bird by agency of which pollination is effected. This attraction involves color and scent, and frequently also nectar, which is secreted in some part of the flower. These characteristics that attract pollinators account for the popularity of flowers and flowering plants among humans. Flowers are the reproductive structures of flowering plants. The "male" organ is the stamen or androecium, which produces pollen (male spores) in anthers. The "female" organ is the carpel or gynoecium, which contains the egg (female gamete) and is the site of fertilization. (A single carpel or fused carpels make up the pistil. A gynoecium, the reproductive unit, consists of one or more pistils.) While the majority of flowers are perfect or hermaphrodite (having both male and female parts in the same flower structure), flowering plants have developed numerous morphological and physiological mechanisms to reduce or prevent self-fertilization. Heteromorphic flowers have short carpels and long stamens, or vice versa, so animal pollinators cannot easily transfer pollen to the pistil (receptive part of the carpel). Homomorphic flowers may employ a biochemical (physiological) mechanism called self-incompatibility to discriminate between self- and non-self pollen grains. In other species, the male and female parts are morphologically separated, developing on different flowers. At the period of fertilization the embryo sac lies in close proximity to the opening of the micropyle, into which the pollen-tube has penetrated, the separating cell-wall becomes absorbed, and the male or sperm-cells are ejected into the embryo sac. Guided by the synergidae, one male cell passes into the oosphere with which it fuses, the two nuclei uniting, while the other fuses with the definitive nucleus, or, as it is also called, the endosperm nucleus. This remarkable double fertilization as it has been called, although only recently discovered, has been proved to take place in widely-separated families, and both in Monocotyledons and of a prothallium after a pause following the reinvigorating union of the polar nuclei. This view is still maintained by those who differentiate two acts of fertilization within the embryo sac, and regard that of the egg by the first male cell, as the true or generative fertilization, and that of the polar nuclei by the second male gamete as a vegetative fertilization which gives a stimulus to development in correlation with the other. If, on the other hand, the endosperm is the product of an act of fertilization as definite as that giving rise to the embryo itself, twin plants are produced within the embryo sac: one, the embryo, which becomes the angiospermous plant, the other, the endosperm, a short-lived, undifferentiated nurse to assist in the nutrition of the former, even as the subsidiary embryos in a pluri-embryonic gymnosperm may facilitate the nutrition of the dominant one. If this is so, and the endosperm like the embryo is normally the product of a sexual act, hybridization will give a hybrid endosperm as it does a hybrid embryo, and herein (it is suggested) the phenomenon of xenia is observed in the mixed endosperms of hybrid races of maize and other plants. This phenomenon indicates that they were the extension of the influence of the extension of pollen beyond the egg and its product. This would not, however, explain the formation of fruits intermediate in size and color between those of crossed parents. The signification of the coalescence of the polar nuclei is not explained by these new facts, but it is noteworthy that the second male cell is said to unite sometimes with the apical polar nucleus, the sister of the egg, before the union of this with the basal polar one. The idea of the endosperm as a second subsidiary plant is not new; it was suggested long ago in explanation of the coalescence of the polar nuclei. However, it was then based on the assumption that these represented male and female cells, an assumption for which there was no evidence and which was inherently improbable. The proof of a coalescence of the second male nucleus with the definitive nucleus gives the conception a more stable basis. The antipodal cells aid more or less in the process of nutrition of the developing embryo, and may undergo multiplication, though they ultimately disintegrate, as do also the synergidae. As in gymnosperms and other groups, an interesting qualitative change is associated with the process of fertilization. The number of chromosomes in the nucleus of the two spores, pollen grain, and embryo sac, is only half the number found in an ordinary vegetative nucleus. This reduced number persists in the cells derived from them. The full number is restored in the fusion of the male and female nuclei in the process of fertilization, and remains until the formation of the cells from which the spores are derived in the new generation. In several natural orders and genera, departures from the course of development just described have been noted. For example, in the natural Order Rosaceae, the Series Querciflorae, and the very anomalous Genus Casuarina, instead of a single macrospore, a more or less extensive sporogenous tissue is formed, but only one cell proceeds to the formation of a functional female cell. In Casuarina, Juglans, and the Order Corylaceae, the pollen tube does not enter by means of the micropyle, but passing down the ovary wall and through the placenta, enters at the [] end of the ovule. Such a method of entrance is styled chalazogamic, in contrast to the porogamic or ordinary method of approach by means of the micropyle. The result of fertilization is the development of the ovule into the seed. By the segmentation of the fertilized egg, now invested by cell membrane, the embryo plant arises. A varying number of transverse segment walls transform it into a pro-embryo, a cellular row of which the cell nearest the micropyle becomes attached to the apex of the embryo sac, and thus fixes the position of the developing embryo, while the terminal cell is projected into its cavity. In Dicotyledons, the shoot of the embryo is wholly derived from the terminal cell of the pro-embryo, from the next cell the root arises, and the remaining ones form the suspensor. In many Monocotyledons, the terminal cell forms the cotyledonary portion alone of the shoot of the embryo, its axial part and the root being derived from the adjacent cell; the cotyledon is thus a terminal structure and the apex of the primary stem a lateral one, a condition in marked contrast with that of the Dicotyledons. In some Monocotyledons, however, the cotyledon is not really terminal. The primary root of the embryo in all Angiosperms points towards the micropyle. The developing embryo at the end of the suspensor grows out to a varying extent into the forming endosperm, from which it derives good material for growth through surface absorption; at the same time the suspensor plays a direct part as a carrier of nutrition, and may even develop, where perhaps no endosperm is formed, special absorptive "suspensor roots" which invest the developing embryo, or pass out into the body and coats of the ovule, or even into the placenta. In some cases, the embryo or the embryo-sac sends out suckers into the nucellus and ovular integument. As the embryo develops, it may absorb all the food material available, and store, either in its cotyledons or in its hypocotyl, what is not immediately required for growth, as reserve food for use in germination, and by so doing it increases in size until it may fill entirely the embryo sac. Or its absorptive power at this stage may be limited to what is necessary for growth and it remains of relatively small size, occupying but a small area of the embryo sac, which is otherwise filled with endosperm in which the reserve food is stored. There are also intermediate states. The position of the embryo in relation to the endosperm varies; sometimes it is internal, sometimes external, but the significance of this has not yet been established. The formation of endosperm starts from the endosperm nucleus. Its segmentation always begins before that of the egg, and thus there is timely preparation for the nursing of the young embryo. If, in its extension to contain the new formations within it, the embryo sac remains narrow, endosperm formation proceeds upon the lines of a cell division. However, in wide embryo sacs, the endosperm is first of all formed as a layer of naked cells around the wall of the sac, and only gradually acquires a pluricellular character, forming a tissue filling the sac. The function of the endosperm is primarily that of nourishing the embryo, and its basal position in the embryo-sac places it favorably for the absorption of food material entering the ovule. Its duration varies with the precocity of the embryo. It may be wholly absorbed by the progressive growth of the embryo within the embryo-sac, or it may persist as a definite and more or less conspicuous constituent of the seed. When it persists as a massive element of the seed its nutritive function is usually apparent, for there is accumulated within its cells reserve food, and according to the dominant substance it is starchy, oily, or rich in cellulose, mucilage or proteid. In cases where the embryo has stored reserve food within itself and thus provided for self nutrition, such endosperm as remains in the seed may take on other functions, for instance, that of water-absorption. Some deviations from the usual course of development may be noted. Parthenogenesis, or the development of an embryo from an egg cell without the latter having been fertilized, has been described in species of Thalictrum, Antennaria, and Alchemilla. Polyembryony is generally associated with the development of cells other than the egg cell. Thus, in Erythronium and Limnocharis the fertilized egg may form a mass of tissue on which several embryos are produced. Isolated cases show that any of the cells within the embryo-sac may exceptionally form an embryo, e.g. the synergidae in species of Mimosa, Iris, and Allium, and in the last-mentioned the antipodal cells also. In Coelebogyne (Euphorbiaceae) and in Funkia (Liliaceae) polyembryony results from an adventitious production of embryos from the cells of the nucellus around the top of the embryo sac. In a species of Allium, embryos have been found developing in the same individual from the egg cell, synergids, antipodal cells and cells of the nucellus. In two Malayan species of Balanophora, the embryo is developed from a cell of the endosperm, which is formed from the upper polar nucleus only, the egg apparatus becoming disorganized. The aforementioned case has been regarded as representing an apogamous development of the sporophyte from the gametophyte comparable to the cases of apogamy described in ferns. But the great diversity of these abnormal cases as shown in the examples cited above suggests the use of great caution in formulating definite morphological theories upon them. As the development of embryo and endosperm proceeds within the embryo sac, its wall enlarges and commonly absorbs the substance of the nucellus (which is likewise enlarging) to near its outer limit, and combines with it and the integument to form the seed-coat; or the whole nucellus and even the integument may be absorbed. In some plants, the nucellus is not absorbed, but itself becomes a seat of deposit of reserve food, constituting the perisperm, which may coexist with endosperm, as in the water lily order, or may alone form a food reserve for the embryo, as in Canna. Endospermic food reserve has evident advantages over perispermic, and the latter is comparatively rarely found and only in non-progressive series. Seeds in which endosperm or perisperm or both exist are commonly called albuminous or endospermic, those in which neither is found are termed exalbuminous or exendospermic. These terms, extensively used by systematists, only refer, however, to the grosser features of the seed, and indicate the more or less evident occurrence of a food reserve. Many so-called exalbuminous seeds show to microscopic examination a distinct endosperm that may have other than a nutritive function. The presence or absence of endosperm, its relative amount when present, and the position of the embryo within it, are valuable characters for the distinction of orders and groups of orders. Meanwhile, the ovary wall has developed to form the fruit or pericarp, the structure of which is closely associated with the way the seed is distributed. Frequently the influence of fertilization is felt beyond the ovary, and other parts of the flower take part in the formation of the fruit, as the floral receptacle in the apple (Malus), strawberry (Fragaria), and others. The character of the seed coat bears a definite relation to that of the fruit. Their function is the twofold one of protecting the embryo and of aiding in dissemination; they may also directly promote germination. If the fruit is a dehiscent one, involving the spontaneous opening at maturity of a plant structure, such as a fruit, anther, or sporangium, to release its contents, and the seed is therefore soon exposed, the seed coat has to provide for the protection of the embryo and may also have to secure dissemination. On the other hand, indehiscent fruits discharge these functions for the embryo, and the seed coat is only slightly developed. Angiosperm Phylogeny Group (APG). 2003. An update of the Angiosperm Phylogeny Group classification for the orders and families of flowering plants: APG II. Botanical Journal of the Linnean Society 141: 399-436. Available online. Retrieved March 4, 2008. Cronquist, A. 1981. An Integrated System of Classification of Flowering Plants. New York: Columbia Univ. Press. Raven, P.H., and G. B. Johnson. 1996. Biology, (Fourth Edition). Wm. C. Brown Publishers. ISBN 0697225704. This page was last modified on 3 April 2008, at 17:39.